If indeed you have heard Him and have been taught in Him, just as truth is in Jesus, that, in reference to your former manner of life, you lay aside the old self, which is being corrupted in accordance with the lusts of deceit, and that you be renewed in the spirit of your mind, and put on the new self, which in the likeness of God has been created in righteousness and holiness of the truth. But like the Holy One who called you, be holy yourselves also in all your behavior; because it is written, “You shall be holy, for I am holy.” If you address as Father the One who impartially judges according to each one’s work, conduct yourselves in fear during the time of your stay on earth; knowing that you were not redeemed with perishable things like silver or gold from your futile way of life inherited from your forefathers, but with precious blood, as of a lamb unblemished and spotless, the blood of Christ. Because of the surpassing greatness of the revelations, for this reason, to keep me from exalting myself, there was given me a thorn in the flesh, a messenger of Satan to torment me—to keep me from exalting myself! Concerning this I implored the Lord three times that it might leave me. 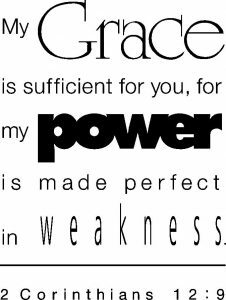 And He has said to me, “My grace is sufficient for you, for power is perfected in weakness.” Most gladly, therefore, I will rather boast about my weaknesses, so that the power of Christ may dwell in me. Therefore I am well content with weaknesses, with insults, with distresses, with persecutions, with difficulties, for Christ’s sake; for when I am weak, then I am strong.